Welcome to Amma's Canteen - South Indian Restaurant / Street Kitchen! Kerala, aka 'God's own Country' has come to Chorlton, South Manchester. Amazing meal at Ammas, the staff were friendly and professional. They were very knowledgeable about the menu and the food was AMAZING!! We definitely over ordered but it was worth it, we will definitely be back. Our only suggestion is that the lighting should be dimmable to give a cosier feel on the dark evenings, other than that we had a brilliant time!! the dosa (masalla) starter was generous and tasy and notbtoo hot (really a main)l the sea bass was too hot for me -i have a delicate stomach and it said with mild spices-however staff (and owner) were very solicitous and mad e it less spicy with yoghurt and gave me a dish to add further yoghurt if i wished. they werre very friendly and interested in us (my son and i) and gave us an extra dessert due toi the spicyness of my dish.we both had the plantain dessert which was delicious.my son's starter was falafel and coleslow and a fried breaded chicken dish and a lamb main all of which he enjoyed. price in total was £72 including tip perhaps a little pricey but also affected obviously by the number of dishes we had.son had a coke. I've been here quite a few times with my family now. The food is consistently excellent , service is friendly but not intrusive. Would always recommend this place for anyone who likes authentic South Indian food. Four of us had the absolute pleasure of experiencing this truly sensational South Indian dining experience last night. As soon as we walked into the restaurant we were given a warm welcome by the lovely waiter. He asked us if we had been before and having told him we hadn't he proceeded to explain the menu to us. The selection on offer looked so mouthwatering. After some slight deliberation we decided on 5 of the dishes from the Street Cart - Porucha Vendaka (crispy stuffed Okra), Chicken 65 (my favourite), Madras Masala Mussels, Tamarind chicken wings and sautéed prawns in whole red chilli, crushed shallots and coconuts. We also had Chicken Thoran Dosa and Beef Dosa from the Dosa Griddle and Kari Kulambu Poratha (slowly cooked lamb) from the Pot. Lamb is my personal favourite as a choice of meat and this dish was right up there at the top with my experience of food tasted. So now for dessert. We plumbed for Golden Plantain and the Trio Dessert. All so scrum my. Now that I have got you drooling and wanting to sample this wonderful South Indian cuisine let me tell you about the fabulous service. From the lovely waiter to the really friendly owners Saju and Ganga we were treated like VIPs. We loved hearing Saju's childhood memories of eating squid as a child and how important family was to him. So much so that all of the dishes on the menu are cooked from scratch using only the freshest ingredients and with no unnecessary additions. The menu he would give to his young family knowing that it is the finest of food. It was great to hear that Saju had worked closely with the Timpsons family and knew The White Eagle in Rhoscolyn on Anglesey where I used to work many moons ago. Love everything about Amos Canteen. The flavours of all the dishes I have had are just lovely. 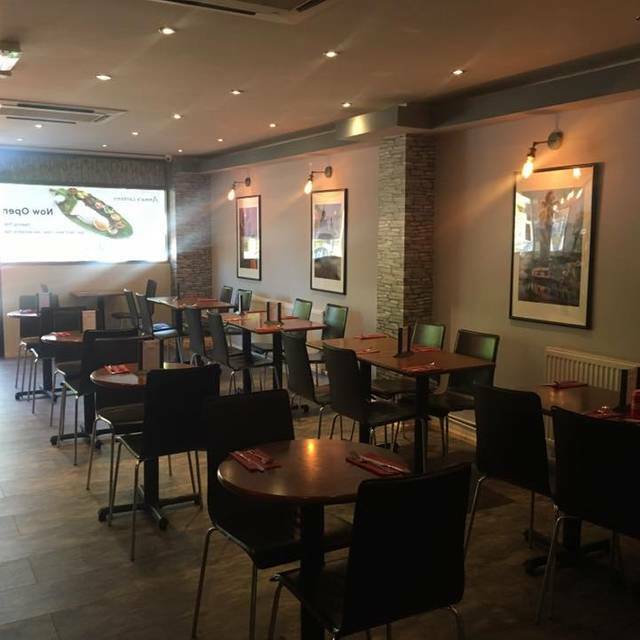 Staff are lovely and friendly and give advise on the dishes you have ordered. Gem of a place to visit. 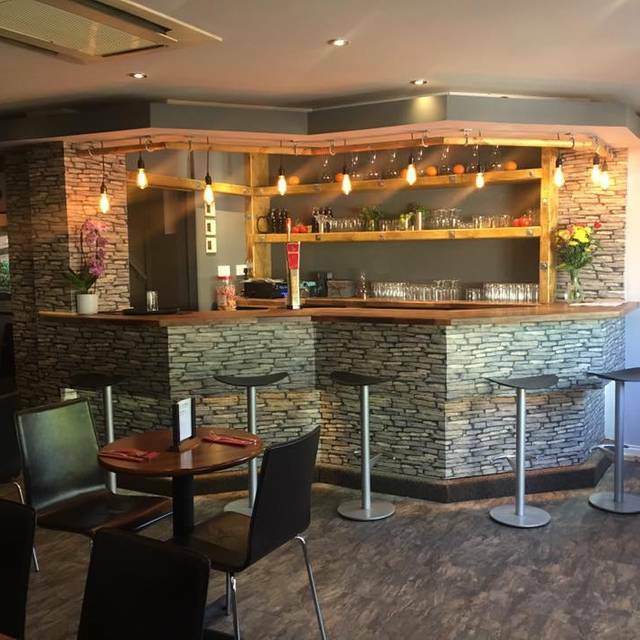 The restaurant is cosy and chilled with excellent attentive service. The food is brilliant with plenty of options including vegetarian & Vegan. South Indian dishes are fresh, authentic, colourful and tasty, all cooked to a high standard with various amounts of spice. A really great place, highly recommended. Excellent service. Food was delicious - just as good the next day when eating the leftovers we took home! Excellent food, as always. Service is very attentive without being intrusive. As the evening (a Friday) went on, it became very noisy - I think this is due to low ceiling and haard surfaces. Excellent food & service as always. Been there 3 times now & my partner & I have thoroughly enjoyed it every time!! Wonderful imaginative food. Friendly helpful service. Total neighbourhood gem. (Also great vegan and vegetarian options). Lovely staff , great charity night . Loved the shredded beef and the goat curry ! Been here several times. Food is always exceptional and staff are always friendly and helpful. Would highly recommend. Lived up to my expectations and more. Great family run place with simply delicious food. Lovely food - quite unusual and very high quality. Highly recommended. Great food. Great Service. Great Staff. Wanted to try this little restaurant since it opened. Finally got round to going on a nice Saturday evening. Was pleasantly surprised at the décor and how spacious it was. they don't cram you in like some restaurants. Wasn't sure at first what was a starter or a main course but the lady was very helpful in explaining to us and giving advice. Didn't identify any of the courses on the menu from times I've visited India or Indian restaurants in England, but this all added to the excitement of trying dishes I've never had before. The starters were best described as tapas (small portions). If the main courses weren't appealing we could always have had three or four different smaller portions instead. The ones we sampled were very nice and our main course, Dosas, was different to any other meal we've had. They are highly recommended. Its not many restaurants that ask you if you have any special dietary requirements before you order, but Amma's do, and that's so helpful if you are GF, Veggie, Vegan or have any allergies. Fantastic food. Will definitely be back. Would highly recommend. Tasty food, friendly service and overall lovely atmosphere. This is an awesome South Indian Street Food restaurant with utterly delicious dishes including Dosas. Well worth a visit, you'll be back for more! Really delicious and fabulous menu for allergies and dietary requirements. Staff were very friendly too! We enjoyed the meal but although the quality was good we thought it was rather expensive for what it was. We went for Sunday lunch and were the only people eating there. Loved the authentic food and exceptional customer service. Highly recommend it! 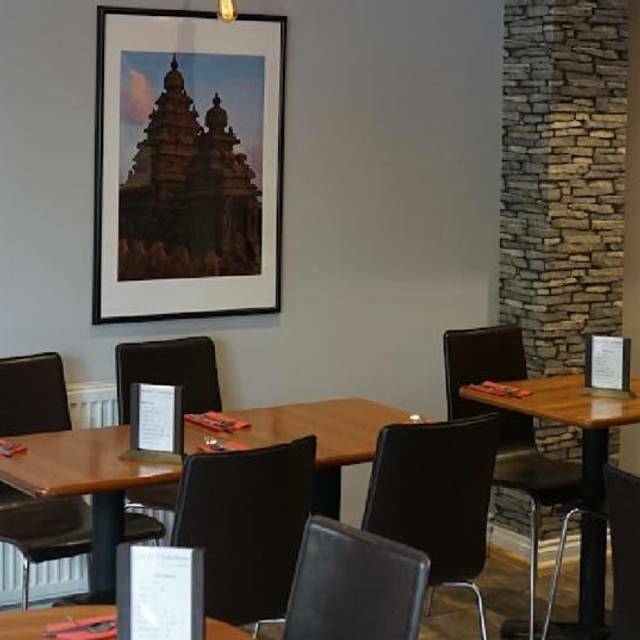 Ammas Canteen is an unusual and authentic South Indian Dining Experience. Having travelled widely in South east Asia, it was great to enjoy a unique and very regional style of cooking ... rather than an anglicised/generic version of Indian food. The chance to try a variety of small dishes .. starter, street food or tapas call it what you like.. helps with the difficult issue of what to choose ... have an extra dish! The deep fried Anchovies and the stuffed okra were superb ... and I don’t like okra! Do yourself a favour ... try it! Really good service and delicious food. Unexpected and unusual flavours for a very reasonable price. Will definitely go back to try the rest of the menu! An authentic South Indian restaurant tucked away from the city. Ammas Canteen is a small but unique blend of south Indian recipes that tastes like home. A variety of dishes to choose from. I had the lamb curry with poratha which was really nice. Fantastic food and great service. I'd heard good things about Amma's Canteen and was delighted to finally go there for lunch with friends. We were all taken aback by quite how brilliant and delicious the food was. My friend commented, "it's like eating food off Masterchef. It's so beautiful. " Another friend, "I can't remember the last meal I had that was as good as that. Normally something is a bit disappointing but everything was amazing". It really was incredible. We spent a good 2 hours enjoying a fantastic lunch, with guidance on what to order from the owner who was really friendly and took time to explain all the dishes to us. The young waiter was attentive without being obtrusive, delightfully polite and seemed happy inn his work. They usually close for lunch at 3, but they kindly brought us coffee, chatted to us about the mixed origins of the food and how things are cooked and let it's relax and stay until past 3:30. Get down there for lunch. No special offers at the moment for lunch but none needed. The process are reasonable and the food is out of this world. This is the second time I have been to Amma's kitchen and the food and service on both occasions has been good. However, each time I have eaten there a different member of staff has asked if/assumed that I am from India (both times I've replied I have a diverse heritage and am from London). I find this line of questioning annoying as being pigeonholed by my looks is not something I expect when going out to eat dinner. So while I will continue to recommend Amma's kitchen to friends, I will not be returning there to eat. Ammas Canteen have everything just right. The food, the service, the ambiance and the price. I can’t believe it took us so long to visit living just down the road. We’ll be back time and time again!